LOS ANGELES -- Critics panned "The Hitman's Bodyguard," which only got a 38 percent fresh rating on Rotten Tomatoes, but the movie topped the weekend box office, besting critical darling "Logan Lucky." Both had notable stars, "Logan Lucky" has Channing Tatum and Daniel Craig, while "The Hitman's Bodyguard" boasts Ryan Reynolds and Samuel L. Jackson, both were opening in over 3,000 theaters and both cost around $30 million to produce. Also, both were targeted toward adults, although one was R-rated ("Hitman's Bodyguard") and one PG-13 ("Logan Lucky"). But when it came to reviews, critics vastly preferred "Logan Lucky," which boasts a "fresh" 93 percent Rotten Tomatoes score. And yet, when presented with the choice, audiences on the whole put their dollars toward "The Hitman's Bodyguard." Even the CinemaScore was flipped with "The Hitman's Bodyguard" earning a B+ and "Logan Lucky" a B - neither of which, it should be noted, is particularly promising for future word of mouth. "It was a battle of the action ensemble cast movies. Audiences looked at these two action movies in the marketplace and made a decision," said Paul Dergarabedian, a senior media analyst for comScore. "I think for audiences they're just looking for the fun of it ... ("The Hitman's Bodyguard") was critic proof. It provided a perfect escape." Lionsgate, which distributed "The Hitman's Bodyguard," expects the film to play well into September. While it's not an all-out flop, the stakes were a little higher for "Logan Lucky." The NASCAR heist pic was not only director Steven Soderbergh's big return to movies after a four-year retirement, but meant to also upend the traditional distribution model with crafty filmmaker-driven know how, independent financing, foreign and streaming service sales and a more concentrated and cheaper marketing push. An $8.1 million debut from over 3,000 screens, however, isn't enough to make a game-changing splash. In fact, it's Soderbergh's lowest wide-opening since his "Solaris" remake, which opened to $6.8 million in 2002. "Solaris" did have a higher production budget than "Logan Lucky's" though. Prior to the film's release, Soderbergh told The Associated Press that he was prepared for any scenario. "At least we got to do it the way we wanted to do it," he said. Dergarabedian posited that the limited exposure for Soderbergh and the producers means that "Logan Lucky" could still be a winning endeavor, despite coming in behind the horror holdover "Annabelle: Creation," which earned $15.5 million in its second weekend. In fourth place was Christopher Nolan's "Dunkirk," one of the summer's bigger successes, with $6.7 million, which bumped its domestic total to $165.5 million. And there were a few milestones too: The buddy comedy "Girls Trip" sailed past the $100 million mark domestically, and "Wonder Woman" crossed $800 million worldwide. But overall the box office is still losing. As of this weekend, comScore estimates that the summer season is down 13 percent from last year, and the year as a whole is down 5 percent. "The deficit keeps going up. We're limping towards the finish line with one leg dragging behind," Dergarabedian said. "It's not a great place to be." 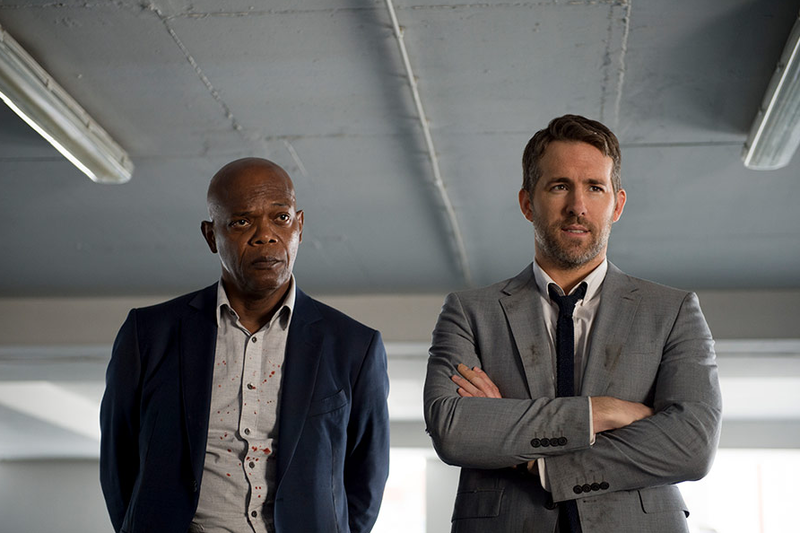 "The Hitman's Bodyguard," $21.6 million ($6.6 million international). "Annabelle: Creation," $15.5 million ($42 million international). "Logan Lucky," $8.1 million ($825,000 international). "Dunkirk," $6.7 million ($8.4 million international). "Nut Job 2: Nutty by Nature," $5.1 million ($950,000 international). "The Emoji Movie," $4.4 million ($11.5 million international). "Spider-Man: Homecoming," $4.3 million ($5 million international). "The Dark Tower," $3.7 million ($7.5 million international). "Wolf Warrior 2," $36 million. "War for the Planet of the Apes," $20.5 million. "The Emoji Movie," $11.5 million. "Despicable Me 3" and "Dunkirk," $8.4 million. "One Hundred Thousand Bad Jokes II," $8.1 million. "Valerian and the City of a Thousand Planets," $8 million. "A Taxi Driver," $7.8 million.